Rank-and-file soldiers will receive increased monthly wages starting this month. The wage hike comes as part of President Moon Jae-in’s campaign pledge to raise the salaries of conscripts to half the minimum wage by 2022. According to revised rules on compensation for public servants, the monthly salary for sergeants has been raised to 405,700 won ($380) per month this year, up from 216,000 won last year. 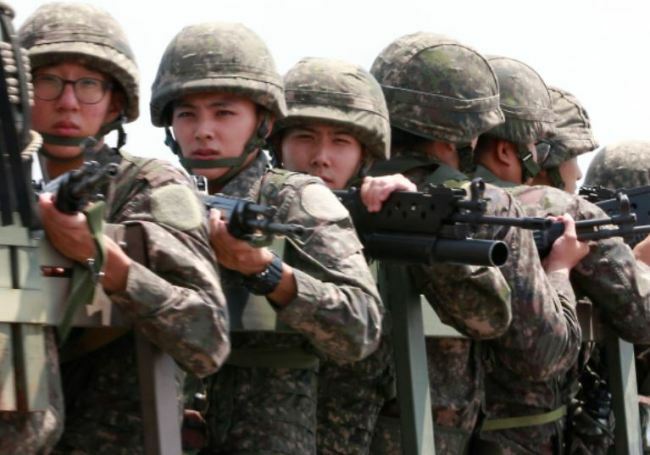 Corporals, privates first class and privates will be paid 366,200 won, 331,300 won and 306,100 won, respectively, in monthly wages this year, up from 195,000 won, 176,400 won and 163,000 won last year. According to the results of a survey conducted last year by the Korea Institute for Defense Analyses on soldiers’ welfare, an active duty soldier needs at least 259,000 won to live in the barracks. “The wage hike would allow soldiers to save a little extra cash,” the Defense Ministry said in a statement. Currently, under an agreement between the ministry and two banks, active duty soldiers can deposit 100,000 won in each bank in monthly installment savings. The ministry said it plans to raise the cap on soldiers’ monthly installment savings so they can save up for after they are discharged. When the gradual wage increase plan is completed in 2022, sergeants, corporals, privates first class and privates will be paid 612,000 won, 552,000 won and 510,100 won each month, respectively. This will allow them to save about 6 million won, equivalent to college tuition for a semester, by the time they are discharged, the ministry said.